Last week DIGIT hosted the first Sharing and Reuse Conference in Lisbon, Portugal. INSPIRE was highlighted as an important contribution to European interoperability, including as a leading example of a Domain Interoperability Framework within the new European Interoperability Framework and as a key action in the 2016-2020 EU e-Government Action Plan. The conference also hosted the first Sharing and Reuse Awards for public administrations sharing IT solutions for potential reuse across Europe, including many geospatial solutions. Cross-border category's winners included gvSIG (provided by the Generalitat Valenciana), an open source GIS widely reused in Spain, and Oskari (National Land Survey of Finland), a platform for creating embedded maps in websites for e-government applications. In the National category, the PDOK (The Dutch Cadastre, Land Registry and Mapping Agency), a distribution platform for spatial datasets and services, appeared alongside geospatial tools such as OpenLayers within examples such as Aerius, from RIVM also in the Netherlands, an online tool to calculate nitrogen deposition levels and share them with different users, including citizens. Winners were also present at regional levels, where Informatie Vlaanderen won a prize for their MAGDA Platform that provides access to base registries and the ability to integrate data from different sources. 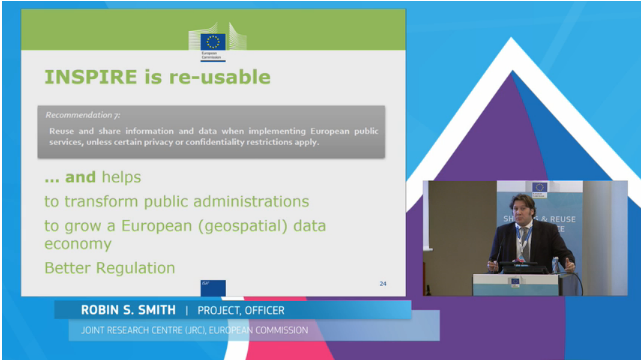 Exploring the role of geospatial data and services in European interoperability, including the application of INSPIRE in a range of sectors and the promotion and further analysis of such examples, is the task of the ELISE Action in the ISA2 Programme.